Patch 1.5 has been out for three weeks now and it pretty much took me until now to take my first steps into the HK-51 quest chain. I don't mind taking it slowly, but in this case my speed has been glacial even by my own standards. It's not just due to the usual distractions though. This post will contain spoilers about the first three parts of the HK-51 chain, if you care about that kind of thing. I do and have generally been trying to avoid being spoiled. I like experiencing things for myself, especially in a game with such a heavy focus on story. Anyway, I did mention before that I actually did the very first step of the chain, the Section X part, on the day of the patch. This wasn't really planned though; my guildie and I just sort of burned through every mission that we found in the area, without differentiating between the dailies and the bits for HK. But then I found myself a little stuck, as the next mission said that it was [Heroic 2]. All things considered I'd probably be able to solo it, but soloing things as a healer is kind of tedious. I'd rather lean back and eat dinner throw heals around while other people kill things. But was it fair to ask someone for help who had already done it? If it was a long mission, that could potentially be quite demanding. Should I ask around to see who else hadn't done it yet? Could I be bothered to do that? Decisions, decisions. Then I read somewhere, despite of my attempts to avoid spoilers, that this particular step of the chain required almost no fighting anyway. Soloing it was, then! I travelled to the Theoretika, an abandoned spaceship, and expected to find the inevitable malfunctioning droids or something, which always seem to infest abandoned spaceships for some reason. But no, there was nothing of the sort. Just lots of empty, dark and silent corridors with the odd corpse on the floor here and there. It was actually quite eerie and atmospheric, especially when the ship occasionally creaked and shook. I soon did something very unusual for an MMO, and ended up hiding my UI while roaming around to increase my field of vision, as it all seemed to come down to finding items to click on and interact with, which didn't require me to use any of my abilities anyway. The whole thing was basically a bit of an adventure/puzzle game that required you to gradually unlock more and more of the derelict spaceship. Most of it was quite straightforward, along the lines of finding a locked door that required security clearance, and then picking up a security access card from a body nearby. It was interesting to have no obvious quest markers or anything of the like to guide me for once, but I appreciated the change of pace. It was slow-going as I spent a lot of time hovering my mouse all over the place, trying to find things to click on, but nonetheless my progress felt smooth. Somewhere around the middle I found myself trapped behind a pool of liquid with electric currents running through it, which required me to figure out a small jumping puzzle to get across while making use of some pipes and ceiling beams. The datacron tag on this blog can attest to the fact that I'm not great at jumping, but for some reason I had no problems with this one whatsoever. I was actually quite chuffed when I made it across without any kind of help or instructions. The point where I hit a wall was when I suddenly got locked in a dark room and was told that I was suffocating. Find a way out! Er, okay? I found a broken fuse quite quickly, but struggled to locate a replacement for it. While my character had a small lamp droid with her, the room was completely dark otherwise and I couldn't for the life of me find anything to click on. I even searched on the ceiling! I was oddly reminded of the difficulties of trying to find the light switches in Maniac Mansion. Eventually I got a bit bored of circling around the room and not finding anything, even though the game kept warning me that I was about to suffocate. I wanted to see how serious that threat was and started to ramble away in guild chat instead of continuing to search, until the timer finally ran out and did indeed knock me out. 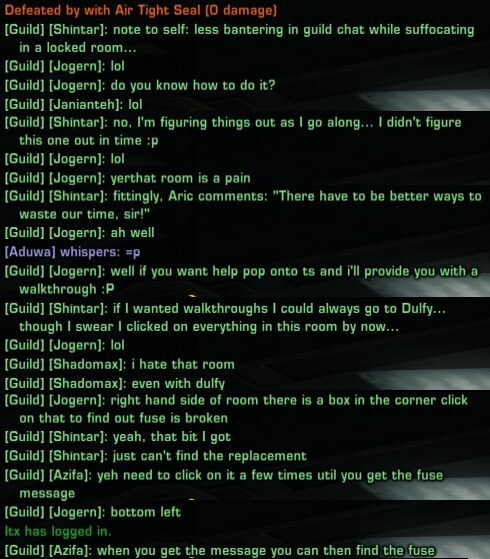 I tried again, but eventually decided to prod guild chat for a hint at least. After they pointed out the tiny cylinder on the rubbish pile in the corner, I managed to escape another death by suffocation with about three seconds to go. After that, my puzzling mojo was gone though. I made it all the way to the end of the ship without further help, but I missed several things on the way and then got frustrated by repeatedly having to go back and try to figure out what I had missed, so I just looked the last couple of steps up on Dulfy. Yeah. Make of that what you will. Today I decided that I would start hunting for the HK parts that are spread out across various planets. I started on Tatooine and was honestly kind of disappointed to find the Outlaw's Den completely devoid of any action. And to think that I had made a point of wearing my PvP gear! So I started running around scanning bits of the area at random, to no avail - until I once again got bored. What do you mean, just buy it from the jawa? I checked the jawa and... oh, there's another one. D'oh. I continued to Taris, where I knew that I would have to use the scanner, but I consulted Dulfy once again to spare myself the annoyance of having to run around scanning god knows how many square metres grid by grid. But hey, what's that? The part that you need isn't always in the same place? Argh. I tried all the example coordinates given in the guide, but none of them wielded any results. Then I just went on another ops run instead of continuing. I'm really not sure how I'm going to muster up the patience to scan considerably sized areas of swamp/ruins/jungle/snow on four more planets one 25-meter-radius circle at a time. How do people do this without going absolutely bonkers with boredom? And why couldn't Bioware just make the scanner work in such a way that it points you in what's vaguely the right direction if you're in the correct area? Or at least provide a slightly more detailed description of where to look? That scanner sounds like a terrible idea. One that homed in on the part, like you suggest, would be a lot better. Is the HK hunt a quest chain, or is it possible to help another person out by finding parts? I don't have any particular interest in HK, at least for my mains (especially my Agent, who already has enough homicidal companions who don't like him, thanks) but the Theoretika part sounds kind of fun - and I have friends who may decide they want an HK, but would be driven up the wall by that part. The scanner is indeed a pain, the only advice is to get the chain done ASAP. If anyone in the area - note that you may need to see if there is more than one instance up - finds the item, everyone can loot it assuming they get there in time. Chatter in /general can help with this. Once most people have the pieces, though, you'll be on your own. I will say that I'm only doing this thing once. 1 million credits (or even /gasp the Cartel coins) will be a small price to pay not to do this again. 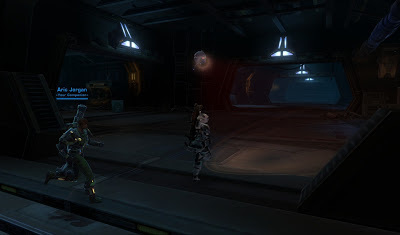 My best advice regarding the HK scavenging hunt: Do it in a group, get on a voice communication system (TS/Mumble/Vent) and just have fun while searching for the part. If you organize a bit, you can get a nice search grid set up (key word: overlap). On my 4th run through, the 4-man group we had set up managed to find all the scanning parts in under 45 minutes, which includes switching to an Imperial character for the Dromund Kaas part. But then I guess for a 4th time, we really should know where to look and how best to do it. The added bonus is, that this same group could then also do the flash points required for the final 2 parts. I'd say all in all, it shouldn't cost much more than 3 hours from start to end. That said, I know of some guildies that say they have spent days searching for a single part. Oh, and @depizan: You can get to the Theoretika if you group up with someone that is on the quest, yes. I have helped several guildies getting through their quest that way, despite already having completed it on that character. Cool! Then I should be able to help out any friends going after HK, or at least tag along and see the place. You've already done the chain four times? 0_0 I... wha... there are no words, lol. The scanner thing is actually somewhat cool, but it needs multiple people in the area to work well. Ideally, several people look for the item, then when one gets a hit, she announces the coordinates in chat. I announced my hits in general chat, even though I wasn't in a group. Then everyone converges on the area until they find it, and everyone can loot it. You can do it on your own, but it is a little painful. I was quite surprised to read how 'difficult' or time-demanding Theoretika was for you Shin. Without any guide or other people's hints, I managed to get it done quite fast (I did spend some time looking for the random parts to open the first door though).